There are many Pepsi variants, including Diet Pepsi, Pepsi Max, Pepsi Samba, Pepsi Blue and Pepsi Gold. Pepsi-Cola was first made in New Bern, North Carolina in the United States in the early 1890s by pharmacist Caleb Bradham. On August 28, 1898 , "Brad's drink" was changed to "Pepsi-Cola" and later trademarked on June 16, 1903. There are several theories on the origin of the word "pepsi". The only two discussed within the current PepsiCo website are the following: 1) Caleb Bradham bought the name "Pep Kola" from a local competitor and changed it to Pepsi-Cola. 2) "Pepsi-Cola" is an anagram for "Episcopal" - a large church across the street from Bradham's drugstore. There is a plaque at the site of the original drugstore documenting this, though PepsiCo has denied this theory. 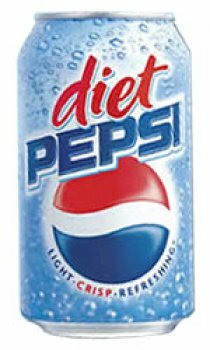 Diet Pepsi and Caffeine Free Diet Pepsi have a light, crisp and refreshing taste with zero calories and fat. Contains: Carbonated water, caramel colour, aspartame, phosphoric acid, potassium benzoate (preserves freshness), caffeine, citric acid and natural flavours.